I have just finished listening/reading to "Wuthering Heights" by Emily Bronte. This is considered a classic book and I felt it was part of my continuing cultural education to read it. The story is set in an old house built beside the moors where winds "wuther" or blow a lot. Just like in the excellent book "The Secret Garden" by Frances Hodgson Burnett. Unlike The Secret Garden, Wuthering Heights is a continuing sad tale about a complete cast of dysfunctional selfish characters. Even the character you would most want to treat favourably, the house maid Ellen/Nellie, is a complete loser who continues to make the wrong choices dooming those in her charge to worse fates. A little bit of honesty and courage would have completely changed the lives she cared so much about. All I knew about Wuthering Heights before reading it was that there were two lovers Heathcliff and Cathy, calling each other's name across a grassy field. Now I know Heathcliff was a selfish, vindictive psychopath intent on destruction for all those who he felt would hinder his "love" for Cathy - a self important selfish stupid girl. Cathy marries the stupid rich guy next door, although she really "loved" the poor selfish guy Heathcliff. Then the girl next door is married to Heathcliff despite all warnings and immediately regrets her choice. The servants, family, lawyers and doctors are all hopeless cases in a tangled "love" story. The love in this story ends with the survivors getting married for no convincing reason. Every other central character (other than Ellen/Nellie) dies a sickly or miserable death. There is no redemption or true love in the whole thing. 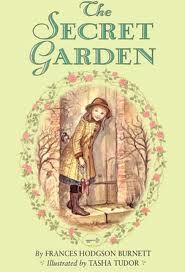 Compare this with The Secret Garden. Now here is a story where we start with lots of self love and selfishness, bitterness and despair. But it all turns around - without any tragic or miserable deaths - with every major character realising the futility of despair and selfishness to be truly happy. And the wisest character is the mother on the moor with a bucketload of children, respected by all for her knowledge and wisdom. I suppose those of a "romantic" disposition favour the "love" story in Wuthering Heights but I reckon this is a real problem. 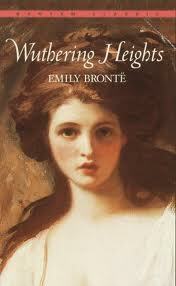 If Wuthering Heights is taken as a guide for how love works it will certainly lead to a life of misery. Look around society today for exactly that result. The Secret Garden is much closer to the truth. And a much better read. Why is it dark in my kitchen? 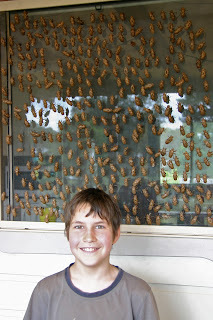 We are in the midst of Cicada season. Every 7 years or so the cicadas make their way above ground, climb whatever they can, shed their skins and settle somewhere else. They sing to each other during the day attracting their mates and after about two or three weeks they go back underground for another 7 years. Only male cicadas sing. They do this in an attempt to find a mate. Different species have different songs to attract only their own kind. Adult cicadas have short lives, usually only a few weeks. Most of their lives are spent as nymphs underground. For some species this can be up to several years. Cicadas feed only on plant sap using their piercing, sucking mouthparts. Cicadas feed on a huge range of plants, including eucalypts and grasses. Birds, bats, spiders, wasps, ants, mantids and tree crickets all prey on cicadas. 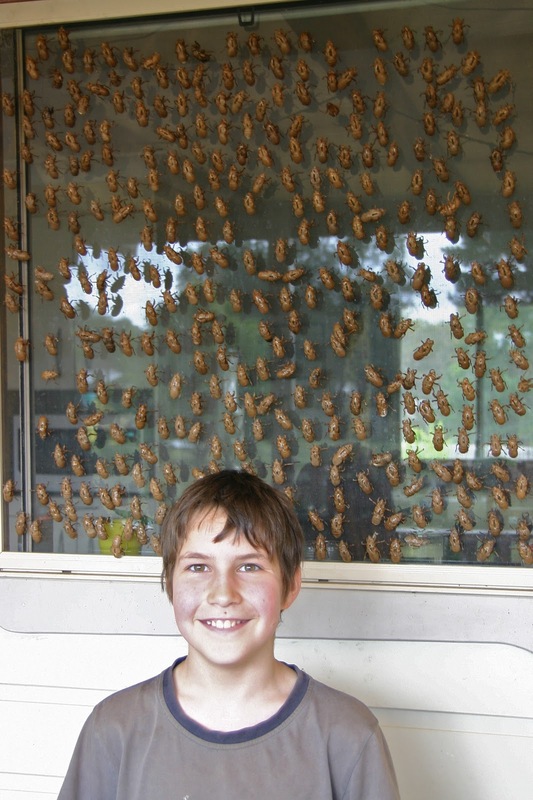 The last point neglected to mention human children as collectors of cicada shells. The majority of the village children collect lots and lots of shells. Peter discovered a novel way of displaying his collection - on the wire screen of the kitchen window. While impressive to behold, it does cut down on the natural light! James has been saving his money from working at the shop for some time and finally bought a huge Lego kit. This was bought online and we had email notification it would arrive today. So James awoke early, did his schoolwork and counted down the minutes until he knew the mail would arrive at the shop. He returned with this lovely large box and quickly took out his kit and with the willing assistance of Peter, Clare, Rose and Martin went to work. Tonight, Lana and I looked at the box, looked at Zach and gave Zach his part of the prize. A box filled with scrunched up newspaper. Hours of fun! On a similar note a customer came in today and asked Ariel what she should buy for her 1 year old grandson. Without any hesitation, Ariel answered, "A tissue box." The customer thought this may not be what she was thinking of and wanted some alternative options. Ariel persisted, 'He would have a lot of fun. He would really like it."